‘Live Audio’, more than ever, is widening its conversation. Got a great interview subject on the cards, or a hot-topic live stream as a radio broadcaster? Facebook Live Audio, the latest quirk in the world’s dominant social platform, is here to make your listeners part of the experience. A pilot version has been making rounds on the web since December 2016, but it’s starting to go mainstream – great news if you’re a SAM Broadcaster user. But what is Facebook Live Audio, you may be asking? Isn’t the company pushing its live video functionality instead? Well, here’s our take on Facebook Live Audio, and what it means for your internet radio station. 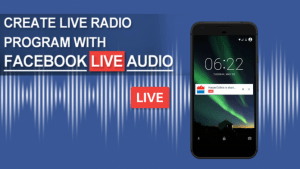 Facebook Live Audio – How it works? You’ve heard of live streaming on Facebook, right? Anyone can initiate a real-time camera stream, alongside a comments box that shows responses to what you’re doing and saying. It works by alerting followers to a live stream before it starts. They have the choice of tuning in or not, but if they’re keen to engage, they’re added to a shared space with every other viewer, and the broadcaster themselves. Both parties – those on video, and whoever’s watching them – can respond to one another. Similarly, Facebook Live Audio does the same for sound-based content. Podcasts, news outlets and (of course) non-for-profit radio stations are on the edge of a brave new world for audience participation. Like its visual cousin, Facebook Live Audio notifies your connections on their Facebook feed, asking them to join in with a stream direct from your mixing desk. How can my audience listen in? But won’t people become tired of fixing their eyes on a comments window? Surely they don’t want to be shackled to Facebook for hours if they stumble across a live programme they like? Don’t worry: the platform has thought ahead. Users can minimize their Facebook app and browse the web elsewhere, as the radio show continues in the background. Then they can leap back in when they hear something they want to discuss. Spacial are pretty excited about what is, essentially, Facebook radio… It’s a new frontier for social and audio channels, and it’ll boost your appeal in a number of ways for both the broadcaster and the listeners. For example, you can hold live Q&As, which can feed back instantly to a guest in your DJ booth. Readings, performances and storytelling can create a real buzz that’ll strengthen relationships in your listener base. Since users can see one another’s comments, they may recognize who says what, and connect with them via a shared opinion of your streams.The Facebook Live Audio feature can also be posted on your wall once you are done with your broadcast. An even bigger advantage is that there is no live video, so the broadcaster wont have to worry about personal appearance. A big benefit for listeners is that the feature does not require a lot of bandwidth compared to live video and listeners can still do other tasks such as scrolling through posts as well as working in other windows whilst listening to your station. You can find a full list of benefits here. The feature has been rolled out to big publishers such as BBC and isn’t available to everyone as yet. Everyone will gain access within the next few months. We are keeping an eye on the ground and will notify you as soon as the feature is Live. In the meantime, plan ahead. No doubt, Facebook Live Audio will play a big role in growing an audience for your online radio station. We will be delighted to bring good news to you.